Compeer recruits, screens, and matches trained volunteers and mentors in one-to-one supportive friendship relationships with children, adults, military veterans, and seniors who are striving for good mental health. Volunteers become positive role models, help raise self-esteem, increase social and communication skills, and encourage independence for their Compeer friends. The relationship between volunteers and their friends encourages a sense of belonging, trust, respect, hope, support, and empowerment. 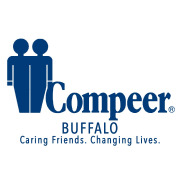 Would you recommend Compeer of Greater Buffalo?